There is a great storm at sea. A woman frantically scrambles to a cabin and hastily does some writing. Her husband finds her and she tells him this is something she must do so the truth is known. They go on the boat’s deck and throw a bottle containing the writing into the stormy waters. Two sisters visit the site of the grave of their parents. Elsa tells Anna she has a surprise for her. 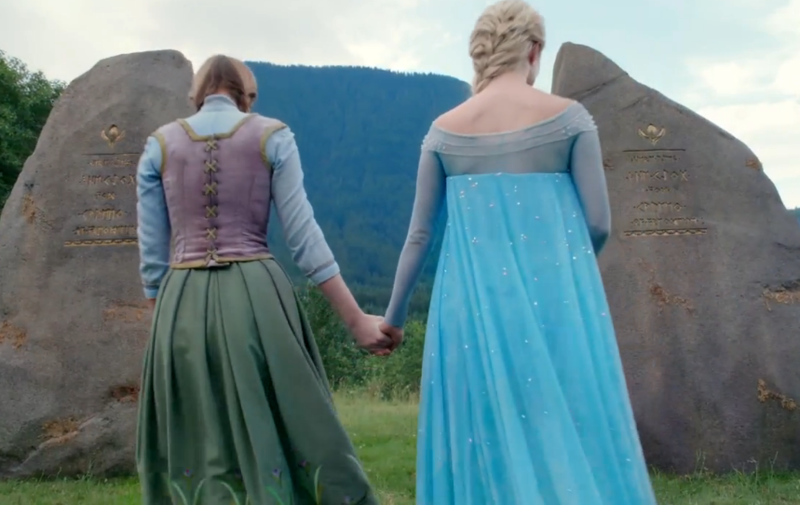 Elsa leads Anna to a room and shows her sister that she has found their mother’s wedding dress. She believes her sister should wear it for her upcoming wedding. Elsa places a necklace with a snowflake around Anna’s neck. As Anna changes into the gown Elsa finds a diary. Elsa becomes upset by what she reads and flecks of snow appear around her head. As Anna is approaching her now wearing the wedding dress an upset Elsa tells her that she believes from what she just read that the death of their parents is her own fault. Anna follows Elsa outside. Elsa has Anna read a passage in the journal. Anna tries to reassure her sister telling her that this is only part of what happened and does not give a full story. Anna takes Elsa to Grand Pabbie for answers. While he is not able to tell them what happened, he is able to tell them where they were going. Anna wants to travel and find answers. She tells Elsa to stay behind with the kingdom. Elsa does not believe Anna should travel alone. She sees Kristoff and Sven. Kristoff lies to Elsa about Anna and she knows this. Elsa has missed Anna but finds out she is traveling to the Enchanted Forest. Elsa is confused and roaming around leaving a trail of ice everywhere she steps. She finds a sign and sees she is in Storybrooke. Emma follows me out of the Diner. While she does her best to apologize, I am so upset that I cannot accept it. Robin and Marion come outside and are quickly followed by others. People ask how I am and Marion is shocked. She does not know I have changed so cannot understand the concern for me especially from her husband. I leave. Grumpy and Sleepy drive. Sleeps falls asleep at the wheel and almost plows into Elsa. She sees them coming and uses magic to freeze the vehicle in place. Elsa runs off and sees a wedding dress in a window. Belle and Gold start their honeymoon. They stop at Neal’s grave. Belle gives him alone time with his son. Mr. Gold talks to the grave and recalls and tender moment with Neal as a child. He then tells his son’s grave that he wants to be a better man and not start his marriage off in a lie. I am surprised to get a visit from Robin. He does not think I am a monster and knows I have changed. He tells me that he has changed as well. Robin tells me that his heart is with me, but he made a vow to Marion and must keep that now that she is alive. I am crushed as he leaves. My sadness causes a mirror to break. I walk over to it and as I pick up a shard and get an idea. I make my way to the hospital and use the elevator to head to the mental ward. I open the door to a room and see Sidney. I tell him I require his help. Belle and Gold arrive at a house. Inside the house, Gold freezes his wife in place and quickly trades daggers so that Belle is in now in possession of the real one. He unfreezes her. Gold then notices an artifact on the table that catches his attention. They enter a ballroom in the house. Gold uses magic to transform the room and music plays. He also transforms their clothing. The beauty and the beast share their first dance as a married couple. Emma, Mary and Henry stroll with the baby. They are concerned for me. Henry believes that I have come too far to revert to my old ways. Hook who believes Emma has been avoiding him interrupts them. Suddenly Grumpy and Happy run to them yelling about being under attack. Emma and Hook search for whoever is leaving the trail of ice. They get close to where Elsa is hiding so she creates a Snowman to stop them. The Snowman chases Emma and Hook away. A newspaper blows by and Elsa grabs it as she recognizes a picture of Rumpelstiltskin on the cover. The paper announces the marriage of Mr. Gold and Belle. I explain to Sidney how Emma brought back Marion. I want him to show me the exact moment I captured Marion in the Enchanted Forest so I can travel back in time and kill her before Emma saves her. Realizing Sidney is useless for this task as a mortal man, I send him back into the Mirror. Sidney is upset but I assure him he will be released. A scene is revealed to me. I see myself demanding of Marion to give me any information she has on Snow White. Marion is haughty and will not help me. I tell my men to take her so I may have her executed. As I turn to leave, Marion tells me that she pities me as I know nothing of what it is like to love and have a family. She calls me a monster. Sidney asks me if this is what I wanted. Although I say yes, her words still linger with me. Emma, Hook, David, Robin, Big John and Marion try to take down the Snowman. As they attack, the Snowman becomes more defensive and knocks everyone out except Marion. I find them in the forest. Marion’s eyes meet mine, she pleads for my help. I destroy the Snowman. Everyone wakes up and a surprised Marion thanks me. I disappear as Emma once again tries to talk to me. Hook gets Emma alone. She tells him she feels guilty over what happened with me using it as what he perceives as an excuse as to why she is avoiding him. Emma leans in like she is about to kiss Hook. She then smiles and pulls away, telling him to be patient. I will not open the door for Emma so she talks to me through it. Emma tells me that she is going to make sure I get a happy ending. Once she leaves, I call on the Mirror again. I tell the Mirror that in the book of Fairy Tales villains do not get happy endings. I tell him, although I have changed I still feel this book is working against me and tell him his next task is to find out who wrote this book so I can change my fate. Gold retrieves the real dagger and uses magic over the artifact that caught his attention. He wants to find out who previously owned this house they are staying in. Elsa finds Gold’s pawn shop. She breaks in and finds her sister’s pendant. Elsa vows that she will find Anna.